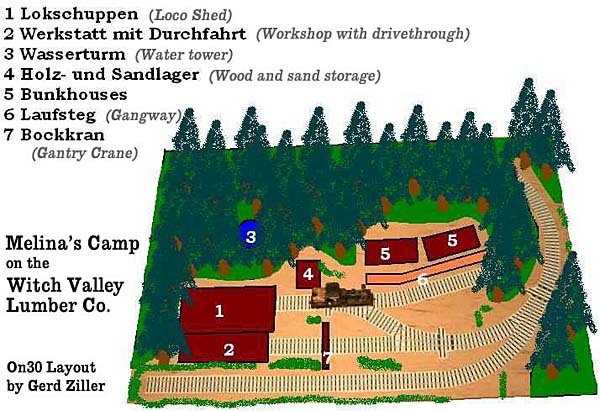 This small U.S.-style logging layout is the work of Gerd Ziller, in Germany. Designed to show off his new On30 Shay loco, Melina’s Camp was designed as a small, backwoods location for maintaining engines and other rolling stock. There are just a few buildings in the camp — an enginehouse with workshop and two bunkhouses. The landscape behind the camp will be mainly a rock wall with many, many trees. This little layout (80×120 cm) is home to lots of operation. Engines come out of the woods and are refilled with wood and water. The small Shay brings freight cars with food and tools to the bunkhouses, and cars in need of repair are moved to the workshop. 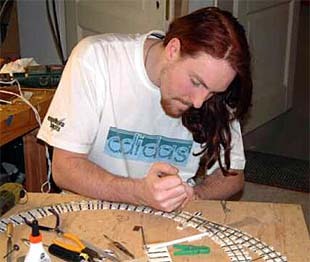 The secret of the operatons is the track to the workshop, which “sneaks off” to make a 180-degree curve, ending behind the background and completing a very-useful continuous loop. It’s useful not only for runarounds, but for breaking in locomotives, and even for just allowing you to settle back and enjoy watching the trains run! 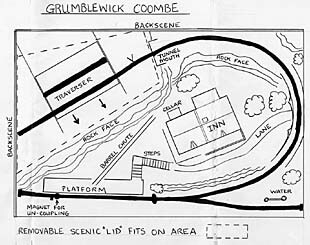 Grumblwick Coombe is a narrow gauge railway in an A3 paper size (16.5″x11.7″) created by Graham and Caroline Watlling, from Norwich, England. 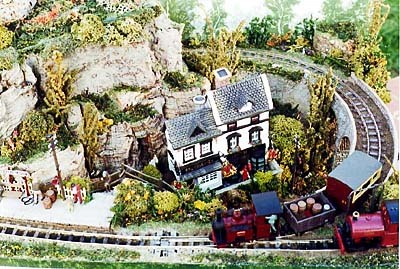 The little rural layout was first covered in the Small Layout Scrapbook Page 8, but Graham has kindly provided some additional photographs and a scale track drawing. 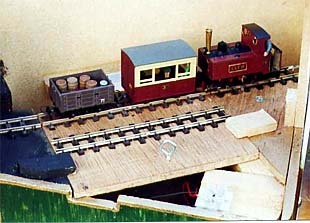 The baseboard is 4 inches high, which allows a three-arch viaduct (a modified N scale kit) to carry the train over the coombe (valley). The train pulls into the station, and passengers make their dignified way down the stairs to the inn while the beer barrels are lowered by ropes down a convenient chute. A second locomotive, seen standing by in the photo above, couples on for the return journey. All in all, a wonderful example of relaxed railroading in the depths of England, during a time now, alas, long past!